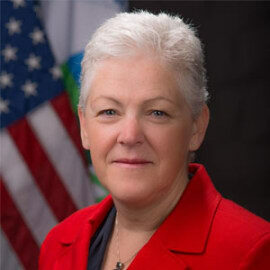 A career public servant in both Democratic and Republican administrations, Gina McCarthy has been a leading advocate for common sense strategies to protect public health and the environment for more than thirty years. As the head of EPA under President Obama, she led historic progress to achieve the administration’s public health and environmental protection goals and Climate Action Plan. In 2015, McCarthy signed the Clean Power Plan, which set the first-ever national standards for reducing carbon emissions from existing power plants, underscoring the country’s commitment to domestic climate action and spurring international efforts that helped secure the Paris Climate Agreement. During her tenure, EPA initiatives cut air pollution, protected water resources, reduced greenhouse gases and strengthened chemical safety to better protect more Americans, especially the most vulnerable, from negative health impacts. Internationally, McCarthy worked with the UN and WHO on a variety of efforts and represented the U.S. on global initiatives to reduce high risk sources of pollution. Known for her pragmatic approaches and disarming, plain-speaking style, McCarthy has earned the respect of the environmental, public health and business communities with her thorough understanding of all sides of climate, air quality, chemical safety, environmental justice and health equity, and water, land and natural resource protection and restoration discussions. A gifted communicator and strategist with a talent for making environmental issues nonpartisan, highly personal, and solidly backed by science and the law, McCarthy is consistently credited with finding common ground and forging sustainable, common sense solutions. Gina McCarthy is currently serving as a Senior Fellow at the Institute of Politics at Harvard and as a Menschel Senior Leadership Fellow at the Harvard T.H. Chan School of Public Health, emphasizing her career-long position that public health and the environment are critically interconnected. Before joining EPA, she served five Massachusetts Democratic and Republican administrations and was Commissioner of the Connecticut Department of Environmental Protection.